Here are a few updates for what is going on in our lives! In January I finished applying to my Radiology program for the second time around. I wont find out if i made it into the program until late March or April so now i have to play the very unpleasant waiting game. Cisco and I are both working and going to school just finishing generals and we have never been busier. We are trying to figure out our plans for this summer and it is a stressful process. I am an over-analyzer. We are deciding between staying here or moving for the summer. If we stayed here we would work and Cisco could take classes. I also am planning on volunteering at the hospital soon but you need to put in 6 months commitment. So where would we go if we moved? Nashville Tennessee. Cisco has been thinking about installing security systems to earn money. It would be great to earn money and put it into savings but there is a lot to consider. We would go out with Kate and Peter so it would be a fun adventure. One thing I would not be excited about it the fact that i would be moving in the heart of country music. For some reason i REALLY don't like country music and i have a feeling there would be no escaping it if i moved there. Maybe if we went i would come out in love with country..... maybe not. On a lighter note, i tend to get stir crazy with my hair and constantly want to try some new style. (thats why i've been blonde, brown, and even pretty red). This weekend we had a blast when Cisco dyed my hair! I got it cut the next day and took the plunge to get bangs. I've never had bangs before so i was terrified they would look bad. They are fun but i still feel weird everytime i look in the mirror. Here are some fun pictures. The finished product. Dyed hair and bangs! How do they look? 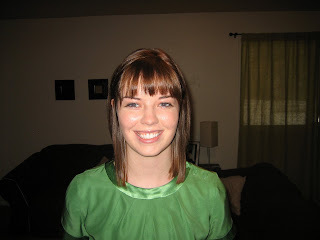 I think I will eventually post some pictures of my hair through the ages because it is funny to see the changes! Oh yeah, love the bangs! I think it's a great idea to move for a little adventure. I doubt the music will really be a problem. I think you guys would have a blast. oo la la! I love your hair michelle. It is very cute. I wish I could pull off bangs like that. Love the bangs! I did hat last summer and they looked awful on me! Boo! but you pull them off really well, I love it! Oh and the country music, I thought it would be everywhere in kansas city.... and it totally wasn't! The only way you'd be surrounded is if you hang out with me :) lol I'll go easy on ya haha! Come come come! (ok pray and see what is right)... and THEN come! I'm so glad to have found your blog, I saw Julie's comment on your facebook and quickly found your blog under your info! I love that Cisco died your hair for you, that made me laugh so hard!